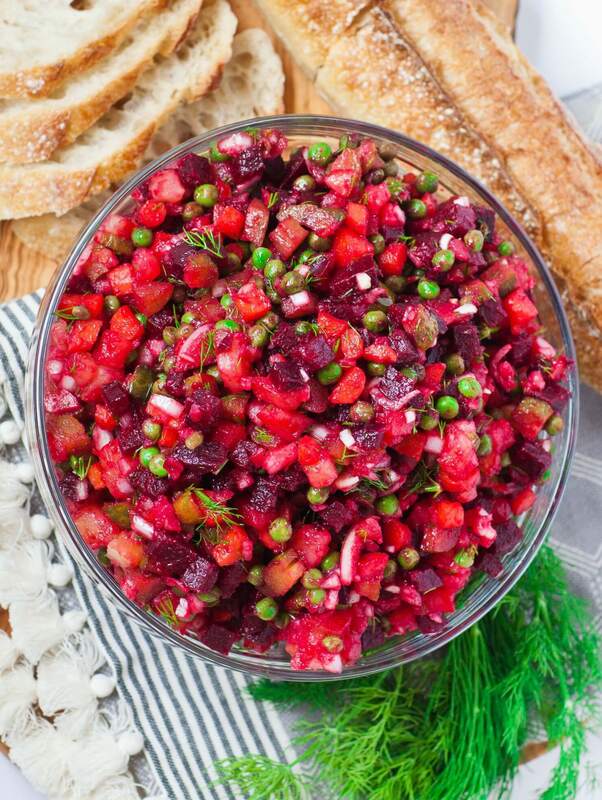 If you love beets, you’re going to love this beet potato salad! 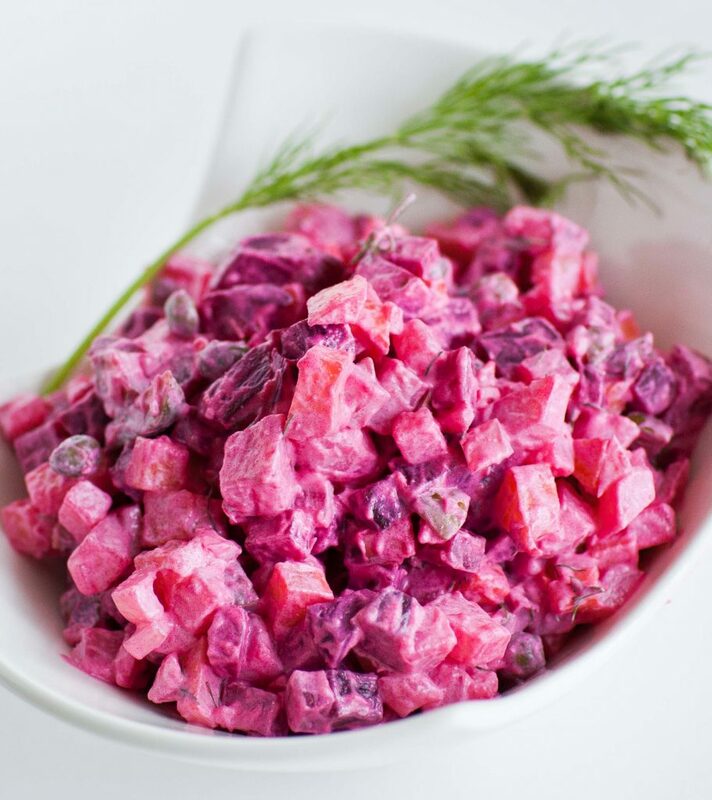 The popular “Vinaigrette” salad is a staple dish at most Ukrainian and Russian gatherings! It’s a potato salad that’s loaded with delicious, sweet beets and dill! I love dressing my salad with tasty extra-virgin olive oil and zesty champagne vinegar. Vinaigrette and Olivier salad are two salads that are synonymous with Slavic food! My grandma used to make it, her mother before her, my mother and now I’m making it at home, too. It’s super easy to make and you can make it ahead of time. Just leave the salad undressed in the refrigerator for up to 3 days; mix it up with you’re ready to serve. Most people boil their vegetables for this salad but I love this new way of oven-roasting my veggies, especially for the beets. They are much heartier and more flavored when oven-roasted, versus boiled. Give it a try next time you’re making this classic! Check out my video recipe for more details! You can also dress this salad with a combination of olive oil mayonnaise and sour cream for a creamy version. I usually go for this creamy version versus the oil and vinegar dressing! Preheat oven to 375F. Line a baking sheet with foil. Peel the carrots but leave the potatoes and beets unpeeled; cut the beets in half. Place vegetables onto prepared pan and cover with foil, sealing the pan tightly. Bake in preheated oven until vegetables are fork-tender; about 25 minutes for carrots, up to 45 minutes for beet and potatoes. Once vegetables have cooked, remove them from the oven and cool completely. Peel the potatoes and beets and dice. Dice the carrots and all of the other ingredients. I used frozen sweet peas and thawed them in hot water; canned peas will also work. Combine all of the vegetables and dill in a large bowl. Season with salt, olive oil and vinegar. This recipe can also be prepared with 1/2 cup mayonnaise. Toss all ingredients together until well combined. Refrigerate if not serving immediately. Loved this salad growing up! It’s been so long since I have made it but you make it look so simple! I should give it a try soon! I grew up in Ukraine and as many other dishes, this salad has different variations in different regions. In my family, we like to add a sour crowd instead of vinegar. Also, I tried it with different oils and sunflower oil suit the best, I think. Hi Tatyana, how do you make the olive oil mayonnaise and sour cream dressing? What is the ratio? You just thaw the sweet peas? No need to cook them? Hi Christine! For the dressing, I usually do about 2/3 mayonnaise and 1/3 sour cream. If you like your salad on the creamier side! I thaw mine with boiling water and I find that it’s the perfect amount of heat. You can also use canned peas if you prefer those.